If you’ve been feeling that your yard is missing something, consider having a retaining wall installed. Allmaster Home Services installs custom retaining walls that instantly boost your landscape and beautify your backyard. 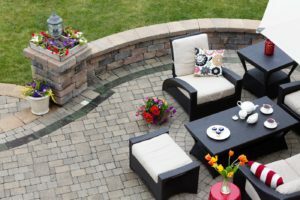 We have been providing outdoor living options to homeowners in White Marsh, Maryland, and nearby communities since 1987, and would be happy to help you next. Allmaster has been in the home improvement industry for several decades, and our employees boast over 75 years of combined experience. We place a large focus on our customer service, making sure we deliver the best products and craftsmanship to homeowners. We are also a veteran- and family-owned and -operated business, but more importantly, we’re homeowners ourselves, so we understand the significance of a correctly done job. For all these reasons, we will work with you closely to ensure you receive the retaining wall you envision. Once you decide on the wall style, Allmaster will schedule an installation time that is most convenient for you. You can rest assured knowing that a team of trained and certified craftsman will install your retaining wall. Contact Allmaster Home Services if you’re interested in having a retaining wall installed at your home in the White Marsh, Maryland, area.